Even though I said last year that I wanted to go to YALC for the whole weekend, I just wasn't sure if I'd be able to withstand it, so I just went on the Sunday. I went with two friends this year which was really lovely and also incredibly helpful for queuing! We got the train on Saturday afternoon and got into Kings Cross, where we ate at Prezzo and had the rudest waiter ever (I've written a letter of complaint), but nice food. Then we got the tube to Earl's Court. I stayed near there last year and it was ideally placed from the Olympia, The hotel we stayed at wasn't the most luxurious, but it was cheap and it did the job. Mostly! On Sunday morning we had planned to get a taxi to the Olympia but due to a cycling event they weren't available, so instead we went back to Earl's Court station and went just one stop to the Olympia stop in Kensington. You come out of the station and the Olympia is RIGHT THERE. We walked round the corner to the YALC entrance, got our wristbands, and went in. Sam decided to go into the LFCC hall to look at the merchandise, so she headed there. Stacey wanted to orient herself, so she and I split up. I went into the first panel, which was New Voices in YA. I had planned to buy The Boy Who Drew the Future by Rhian Ivory, so I went to the Waterstones stall after the panel and bought that and The Square Root of Summer by Harriet Reuter Hapgood. 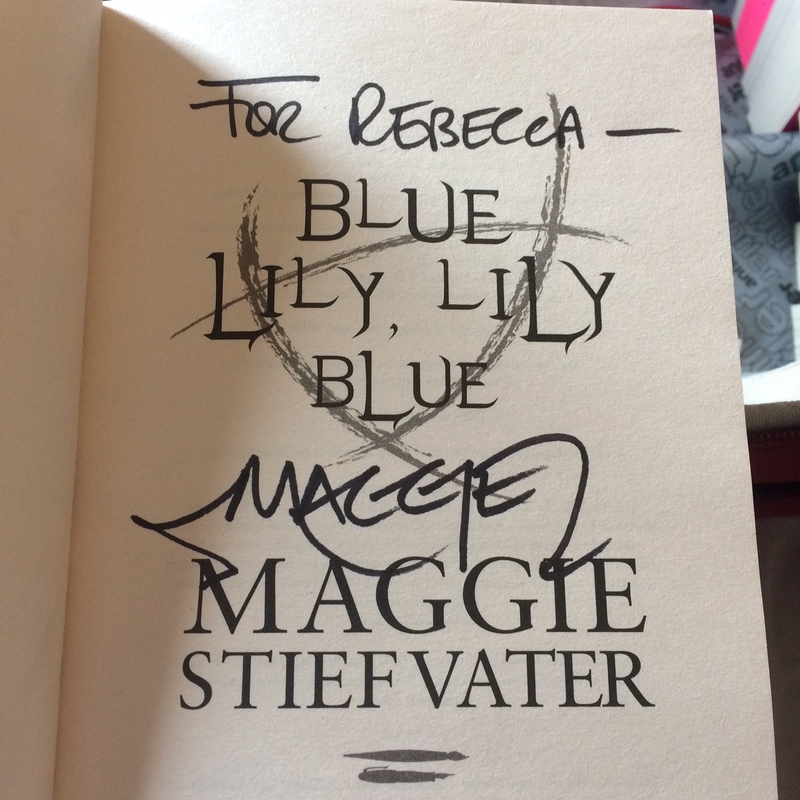 I queued to get both books signed, and Rhian also gave me a poster! And so is this, isn't it so gorgeous? After this, I went to sit in the reading area for a while, and also wandered round some of the stalls. I had prepaped this year and had a wheeled suitcase with me with loads of space for books. I also signed up for the agent 1-2-1s which I did last year and which I felt a hundred times more prepared for this year, especially since my MA novel is finished! At noon, Stacey and I both went into the panel featuring Frances Hardinge, Philip Reeve and Tanya Landman. It was really interesting and they were all fascinating to listen to. Afterwards, I bought Rail Head by Philip Reeve and I'd taken The Lie Tree by Frances Hardinge to get signed. Stacey and I queued for quite a while in Frances' queue, but it was worth it! In the queue I met Kiran who wrote The Girl of Ink and Stars which I've got on Kindle, she was an absolute sweetheart too. At 1pm it was time for the 1-2-1s so I headed there and was in the 2nd lot to be seen. I managed to speak to one of my preferred agents and she was lovely so I'll definitely be submitting my novel to her to see what she thinks. Sam watched the panel on Morally Complicated YA, but Stacey and I had missed the beginning so we decided to join the queue for Louise O'Neill. It was already quite long. We had lunch and made some friends in the queue. I had also already spoken to Michelle of Tales of Yesterday and Luna from Luna's Little Library (who I have a mutual good friend with and who I met briefly last year) and I can confirm they were both lovely too. Louise was really nice, and we had a good conversation about The Handmaid's Tale, which Only Ever Yours is supposed to be like. I may read this next! 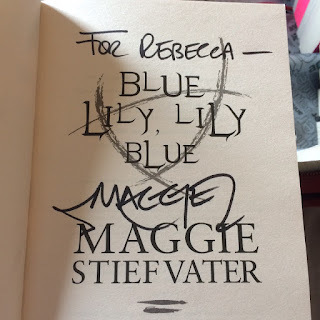 By this point, the queue for Maggie Stiefvater's signing had already started, and got long, and Stacey had already managed to secure me a ticket for my place in the queue. I made the decision to not go into the panel, and I don't regret it. I think they're available to watch online so I will do that at my leisure as I'd love to see what Maggie had to say. I wandered round a bit and bought more books. Lots of publishers had deals on - 3 for £10, 2 for £10 and a free t-shirt, and even 5 for £10 which I took advantage of. Stacey is a teacher and picked up lots of samples for her classroom, and we both got free tote bags which are always good! We had made a base camp near the Maggie queue, and left things with Sam, who had bought lots of film merch and Star Wars fudge! I forgot to go to the Penguin stall and buy Blame by Simon Mayo, because I'm an idiot, but I'll definitely pick it up soon. Eventually it was time for my number in the Maggie queue (and I was lucky, I was high up) and I queued and queued and queued but EVENTUALLY I met Maggie and she was lovely and all was well. See how all the rest of the signings had finished?! I took this copy of Blue Lily, Lily Blue as I borrowed the Dream Thieves and I only have the Raven Boys on Kindle, so it was the first paper copy I have! There were five different tote bags on this stall, I chose this one without knowing anything about her girls or the book, simply because I liked Sadie's hair! I will look into the books for sure. By this point I was exhausted. It was around 4.30 and although there were other things happening, we had all had enough so we headed out and back to the tube station. The tube back to Earl's Court was really busy, and then we managed to get separated. Sam and I found each other but couldn't get hold of Stacey, so headed back to Kings Cross as that's where we all knew we were headed. I was really worried but was telling myself that Stacey is a grown woman and would be fine! We spoke to her at Kings Cross and decided to eat at Carluccio's over in St Pancras, and all met up there, thankfully! Food and service were both really good at Carluccio's, and we still had time to wander around Kings Cross for a while before getting our train back to Wakefield at 8pm. We pulled in just after 10pm and Lee was there to meet me, bless him. I was very tired but very happy - it was a good day! And here on Monday morning are alllll the books I bought, all seventeen of them! I am so excited for Under Rose Tainted Skies, Girl <3 Girl, and If I Was Your Girl. The others are more of me taking a chance, but I bet I'll love them too.